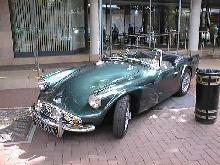 Daimler introduced one of its most controversial models in 1959, the Daimler Dart. Unfortunately due to legal reasons (U.S. firm Dodge already owned the model name!) the "Dart" was quickly renamed the Daimler SP250 and sold as this until its demise in 1964. 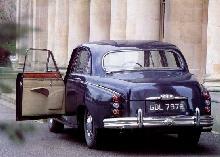 The SP250 was one of first serious British attempts at using GRP for its external coachwork, this explained the cars curious styling! Compared to other contemporary British sports cars the SP250 looked quite outrageous with its tail fins and wide front grille. 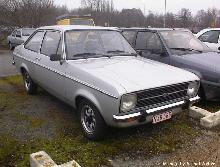 Power came from a powerful 2.5 litre V8 which gave the car a top speed of 120mph, the Police were quick to spot the cars potential for use as a high speed traffic car and many saw service in this role. During the five year production run the SP250 underwent two further specification changes, these are now known as the "B" and "C" spec' cars. When production finally ceased in 1964 over 2,600 examples of the SP250 had been built. 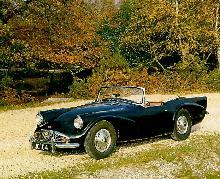 Buyers Guide Daimler SP250 Dart and Standard 8/10 featured in Practical Classics February 2007– available from our sister site Bookbase. Click here to view. 7' 8" 4' 2" 4' 2" 13' 9" 5' 9" 0 (20) 0' 0"